At age eighty, Tony Taylor journeys from Sydney, Australia, to British Columbia to fish the Cowichan River with his eight-year-old grandson, Ned. The trip is an opportunity for Tony to return to a landscape that has had a profound effect on his life and his way of thinking, and to share this place with his grandson. As Tony teaches Ned the patient art of fly-fishing, a lifetime of memories, thoughts, and stories unspool in peaceful reflections by the water's edge. 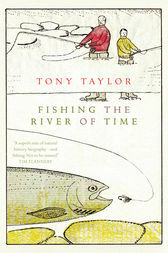 Fishing the River of Time is an elegant meditation on nature, life, and family, written with warmth and wisdom. It inspires self-reflection and an appreciation of the natural world and the fundamentals of our human experience. It is destined to become a classic work of simple living in the mold of Henry David Thoreau's Walden. Tony Taylor: Tony Taylor has studied paleontology and igneous petrology, and worked as a scientific officer at the Natural History Museum in London. He has taught at universities in the U.K. and Australia, and helped to create environmental policy in British Columbia. He lives in Sydney, Australia.